Edge of Paradise‘s follow-up to Immortal Waltz continues its full-on edgy hard rock aural assault. Margarita Monet’s emotively powerful voice again combines with a hard-driving, shredding metal music bed to deliver a set of memorable tunes. 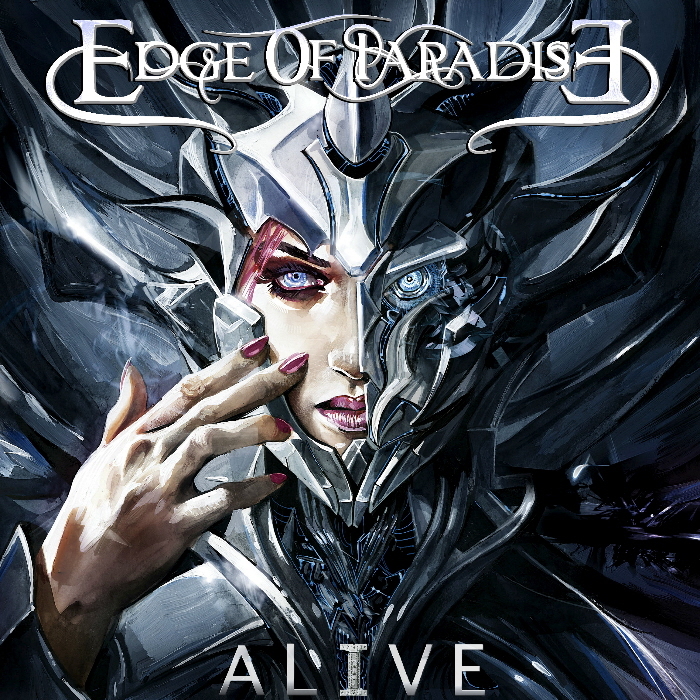 The songs are in Edge of Paradise’s trademark slightly off-balance, funhouse mirror metal style. I gave a sneak peek at a couple of this EP’s tracks at the end of my Immortal Waltz review in 2017. One of those was the title track, “Alive.” Driven by churning guitars, some nearly-full-stop tempo changes, and a breathy flavor to a fair portion of the vocals, this is a power rock track. And it’s stylistically very clearly an Edge of Paradise song. I totally dig the harmonies in hard rocker “Dust to Dust.” Yet, as straightforward as this track is, it still keeps the listener off-balance with croakily growled vocals and off-balance musical backing during the bridges. 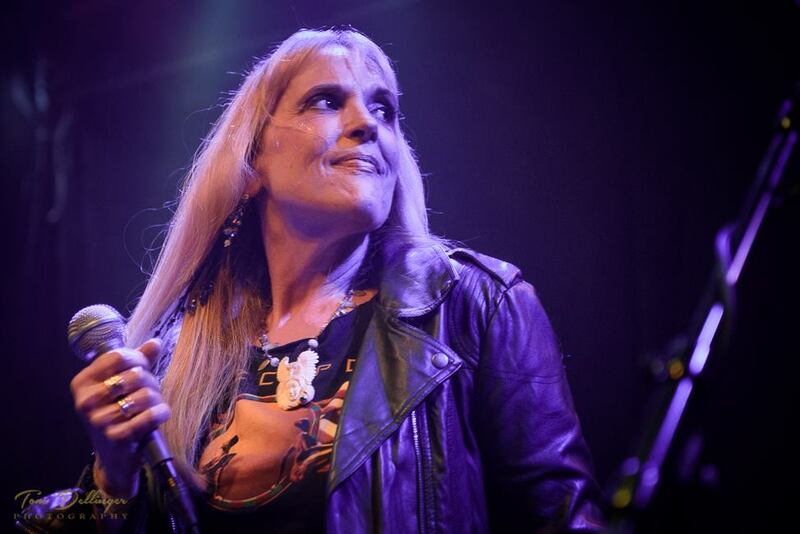 Indeed, nothing about an Edge of Paradise song is ever perfectly straightforward, but this churning rocker sprinkles EoP’s trademark song-twisting elements with a light touch for a fun change of pace. It’s followed by “Mystery,” a theatrical ballad, suitable for anything from radio play to a rock opera performance. Monet’s straining vocals sit atop a music bed based on piano and orchestral strings, driven by booming drums and a rock guitar growl. An extremely touching, emotional, sensitive ballad, “Mystery” shows off Edge of Paradise’s range and is the song on this disc with the broadest cross-genre appeal. The power is back with “Shade of Crazy,” with Monet’s expressive vocals providing texture to the otherwise hard-driving, powerful, crunchy melodic metal song. “Humanoid” closes the Alive EP. Kicking off with frenetic drums and guitars behind an odd croaking vocal, the song evolves into a rhythmic power rocker in which Monet’s vocals are largely another instrument, and the beat is the real star. I’m never sure if Edge of Paradise is one of the more uniquely original progressive rock-influenced melodic heavy metal acts or if they’re one of the more mainstream power rock-influenced heavy theatrical progressive bands on the scene. Regardless, their music is fun to listen to, their musicians and vocalist are top-shelf hard rock/metal talent, and I always look forward to hearing what they’ll do next. I’ve taken so long to get this review written that Edge of Paradise’s new album will be out in just a few months, so there’s plenty to look forward to, but if you don’t already have this EP, it’ll be a great way to fill the gap while the next disc is in the works. In the meantime, also check the band’s website for tour dates. Currently listed are a couple early 2019 shows in Japan – January 31 in Yokohama and February 2, 2019 in Tokyo. The depth, warmth, and emotion of Allyson Paige‘s voice is what first stands out, and it’s the piece of the Little Girl Lost musical tapestry that remains a memorable constant. Stylistically, the three songs included on this musical snippet are old-school, folky country. 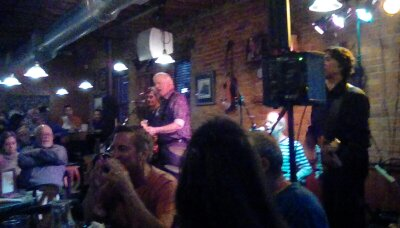 The folkiness comes from Allyson’s picking (and, I assume, grinning) guitar style. The music on this disc would dub Allyson the country singer on an adult contemporary radio station, the folk singer at a country dancehall show, or just the singer-songwriter at an outdoor festival. The most energetic – and most knee-slappin’, twangy – number on the disc is the title track, “Little Girl Lost.” It’s a lively story-filled ditty with tempo changes, hooks, vocal flourishes and guitar runs all endearing this song quite quickly. A fun song, you’d definitely turn the sound up on the radio if this came on. This is (usually) my favorite of the EP’s three songs. The other two cuts on Little Girl Lost are much softer, slower in tempo. First, a heartfelt ode to a certain beloved Gibson guitar, “Gibson Dove.” Sentimental and poignant, Allyson’s voice wavers in all the right spots, cementing this song’s very personal, emotional nature. Final track “Jerry the Viking” sneakily became another favorite over the past many months. A strumming number that most clearly shows off the soaring power of Allyson’s voice, it plods along pleasingly in a sway-to-the-music drinking song style. But one from the end of the night, as everyone’s almost fallen asleep, mellow from perhaps a drink too many, its slow tempo bringing the EP to a close with a warm, pleasant, satisfied feeling. I’m a big fan of song-ordering on discs, and the song order of Little Girl Lost is ideal, opening with energy and closing with relaxing warmth, a feeling of completion. This short collection from Allyson Paige seems like a great introduction to a talented singer. Rather, singer-songwriter, as the well-craftedness of the songs are perhaps the most important element, Allyson’s vox notwithstanding. Of course, if you’re already a fan, it’ll simply be a new favorite. 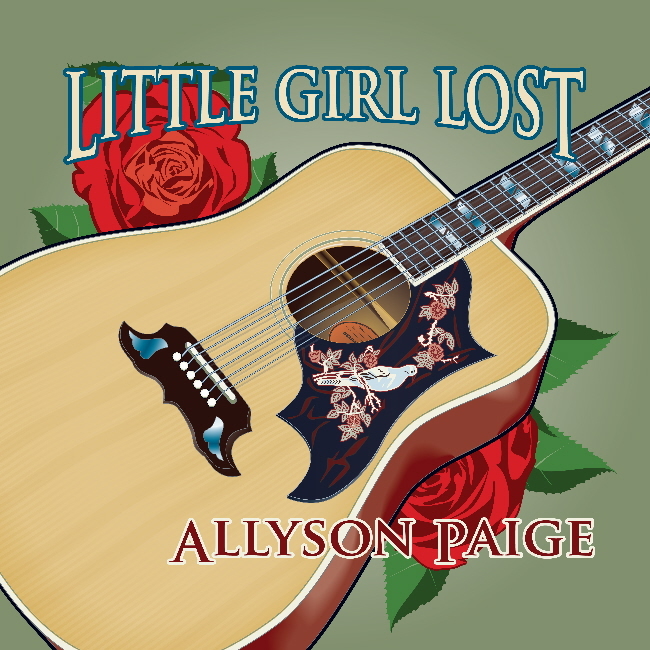 I’m particularly intrigued by the text on the EP’s CD Baby page: “A country folk departure for well known SF Bay Area Blues singer and songwriter Allyson Paige.” Now I really want to hear more of her music. I don’t see any upcoming dates on the gig calendar page of Allyson’s website, but it’s worth keeping an eye on. 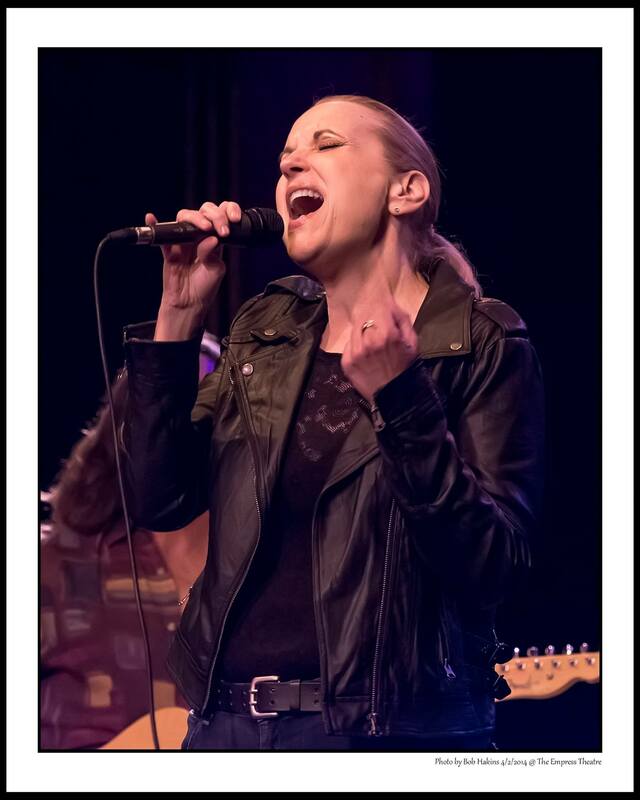 You can also keep an eye on the “happenings” page of Allyson’s Joni Mitchell tribute band, Foni Mitchell.